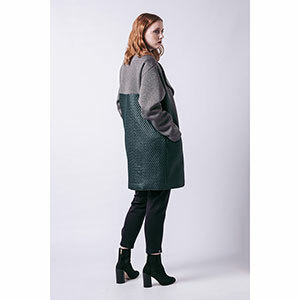 Very loose-fitting, straight-cut coat with lining and contrast back and sides. Mid-thigh length, wide lapels and intersecting cuts at the shoulders. The coat fastens with three snaps, and it has pockets with welts. 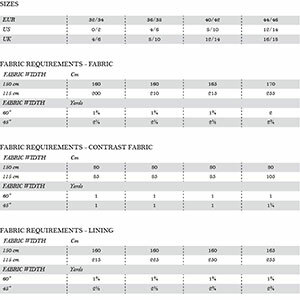 Suggested fabrics are ponte de roma, and medium weight coating fabrics. Use a satin or woven fabrics for the lining.